How fast is this year going I mean, it is Easter in a few days. Whilst Spring has not officially kicked off her in the UK does not mean that I am not investing in some great pieces and beauty products to see me through, tempted to find out more follow my blog. I am all about out with the old and in with the new, a good spring clean is what I require, heck we all do. We need some key pieces in Spring especially as the weather can be unpredictable and what great item to invest in than a trusty mac, great worn on its own, but even better layered up, throw a hoody underneath or even a blazer to give that classic look a fashion lift. Spring brings about bright pastel colours, from your must-have colour of the season lilac to the delectable minty blouse which I am wearing time and time again. It can be worn with anything I have styled it with my classic tapered white trousers, or a casual day worn with a pair of jeans. Just injecting a few pastels into your wardrobe will have you looking Spring ready in no time. 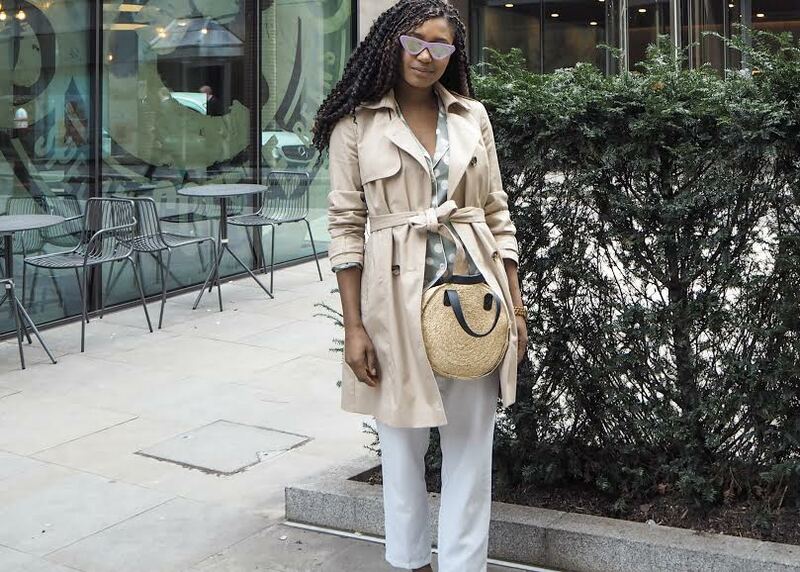 I am all about recycling and last year basket bags were a major must-have item, every fashion gal had one clutched at the hand looking picnic ready even whilst heading into the office, and I can say they are not going anywhere anytime too soon and I am more than happy about that. Do you ever that your complexion changes over seasons?! Mine does, so I am always more than happy to change up my beauty products over the Spring month's, I want something a little bit pinkier a little bit more of a rosy glow to my skin to be looking all soft and dewy. Well, that's what I aim for so I certainly suggest on a good refresh of makeup too., plus do we really need an excuse to go makeup shopping........I think not! Just make sure to hide it from the toddler if you have children. Leanora and Milo were locked away in the bathroom the other day and Milo (cat) came out looking like the Bride of Chuckie, when Leanoa was questioned she told me Milo had asked her to do it...Yeah because I'm that mug haha, thankfully a friend told me all about a website called WOW Free Stuff so think I'll head there for my little minx beauty bits. To complete your Spring investments, I suggest investing in some shades, coloured is preferred, gives your outfit a little pop and they were all over fashion week. Whichever style/shape you go for just make sure they are tinted to be bang on trend this Spring and would look great whilst relaxing by the pool in a high waisted bikini. What pieces will you be investing in this Spring?